Women in Film and Media Pittsburgh (WIFM) and Carnegie Screenwriters co-host a special event with Steve Cuden, author of the newly released Beating Hollywood: Tips for Creating Unforgettable Screenplays Sunday, June 5, 2016, 4:00 p.m. – 6:00 p.m. at the Hollywood Theatre, 1449 Potomac Avenue, Dormont, PA, 15216. The non-profit’s fundraiser will feature Steve Cuden’s seminar, “The Three C’s of Screenwriting: Character, Conflict and Catharsis” and includes a copy of Cuden’s Beating Hollywood for all attendees. For authors, screenwriters, producers, directors, actors, and anyone with a passion for storytelling, the event includes insight into three of the most essential screenwriting elements. Following the seminar, Cuden will sign copies of his book. Light refreshments will be served. Admission $35 and may be purchased through the Women in Film and Media website (www.wifmpit.org). Proceeds from the event go to the Pittsburgh chapter of WIFM. One of the leading authorities on writing for the stage and screen, Steve Cuden, wrote over 90 produced teleplays, and created the international hit, Jekyll & Hyde, The Musical. Cuden, who currently teaches screenwriting at Point Park University, has been writing scripts and educating students for over two decades. 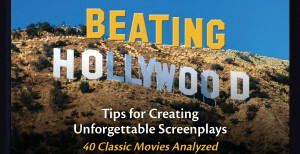 His book, Beating Hollywood is an invaluable resource for just about anyone who writes for and about film and television, including novices, expert writers, professionals, and storytellers of all kinds who write for screens big and small. Tickets cost $35 and will include a copy of his book, a seat at the lecture, and refreshments at the reception.